Mountain Driftboat stocks an assortment of Trailers. We carry Driftboat trailers, raft trailers and utility trailers. All our trailers are manufactured by Adams Mfg., who has been making trailers for Clackacraft driftboats for 20 years. Driftboat trailers comes in two finishes painted black and galvanized. The galvanized trailer is hot dipped in zinc and will not rust. It comes stock with a winch post, roller bar and torflex axle. Raft trailers come in paint only. Some raft models tilt and all come with a mounted spare tire. The raft trailers come in 3 sizes. a) 7ft. by 10ft. fits a 14ft. to 16ft. raft (shown above). c) 8ft. by 16ft. commercial raft trailer. This trailer tandem axles, 4 rollers and fits up to two 20 ft. rafts. Utility trailers come in three sizes. All utility trailers have a rear loading ramp. a) 6ft. by 12ft. 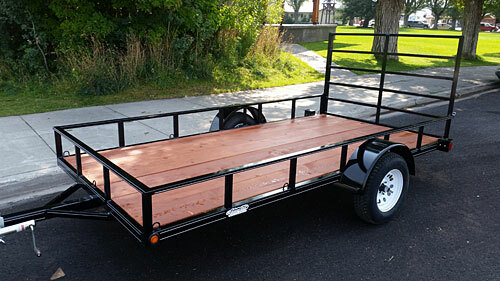 this is our most popular utility trailer and is shown here.